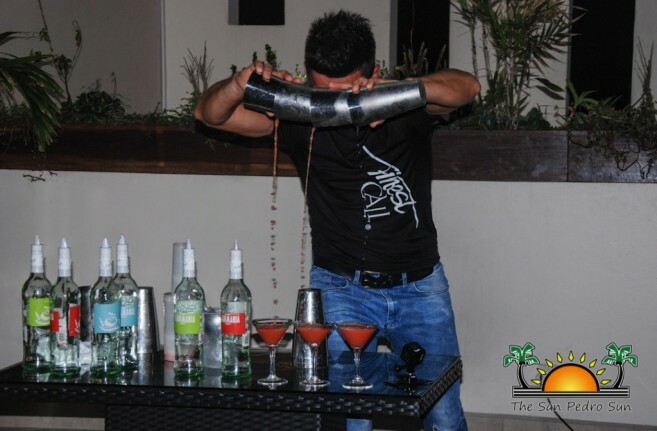 World champion flair bartender Alexander Shtifanov delivered a spectacular show on Thursday, March 9th at Rain Restaurant and Rooftop Terrace in Northern Ambergris Caye. For a small fee, attendees enjoyed a world class show, which began shortly after 10PM. Shtifanov, originally from Russia, has been around the world entertaining people with his incredible flair skills. During his performance last week, he impressed the group as he juggled bar tools and liquor bottles in tricky, and dazzling ways. While manipulating the different bar items, Shtifanov managed to mix a cocktail, which he then passed on to some of the spectators. It was Shtifanov’s first time in Belize and he enjoyed his stay on La Isla Bonita. “I feel happy to be here in San Pedro,” he said. “I have been in many places around the world, but Belize has some of the nicest people.” Shtifanov also stated that he has been practicing flair bartending for over 12 years and like anything else, it is not impossible to learn an art like that. He encourages anyone to pursue their goals, even if they may seem difficult. According to him, dedication and believing in oneself is the key to success.